These pictures were taken back in 2012 when I moved back home. This was prior to my son and Sylverleaf coming to stay with us. At the time I lived in the basement, as the entire living arrangement had been changed since I moved out. I finally had a bit more room to make altars and shrines, and much of my parents’ resistance to such things in their home was gone. They recognized my need for space to set out devotional space for worship, and I will always be grateful to them for this. I made an altar to the Gods, a shrine to the Ancestors, a shrine to the Earthvaettir combined with the Moneyvaettir and Warrior Dead, and a shrine to the Animal Spirits. At this point in time my Gods’ Altar was still fairly squished, at least compared to how it is now. It is also a lot more simple; the Gods’ Altar as it is now has a lot more statuary and representations on it, whereas this was me trying to get back to some simplicity. For example, the Chaos Star got packed away, as at the time I felt I’d had more than what I had needed of that. 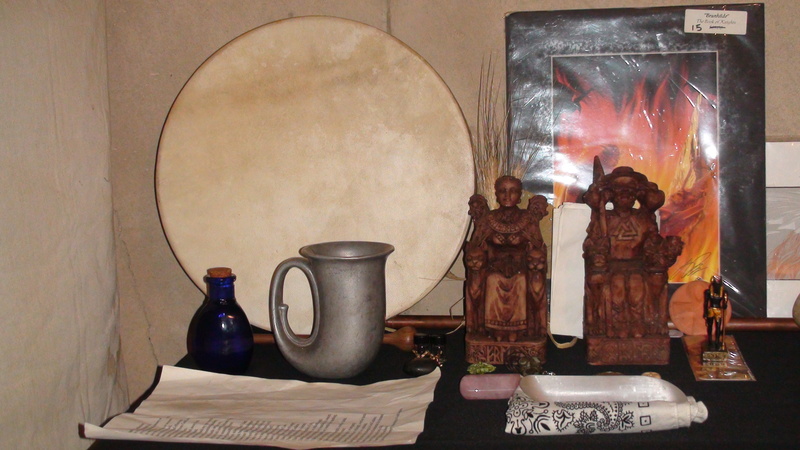 The drum I made my journeys with was placed on the Gods’ Altar as I did a lot of journeywork to Their Realms at this point in time with Its help. There are two chalices on the altar here: the pewter one I dedicated to Freya as our relationship was going very well, and She was teaching me a lot at this time. That, and the chalice, which, if memory serves I had picked up at a thrift store, had at one point been given to someone as a Valentine’s gift back in 1985. I found not long after I started using this that anything placed in the chalice would degrade and mold quick, despite repeated cleanings. It has since been retired from service to any Gods since I can’t get it stop doing weird stuff to the contents within a few hours of being in the thing. There’s also more prominence to the Valkyries’ representations here, with Brynhilde being directly behind Odin, and another to Her right. 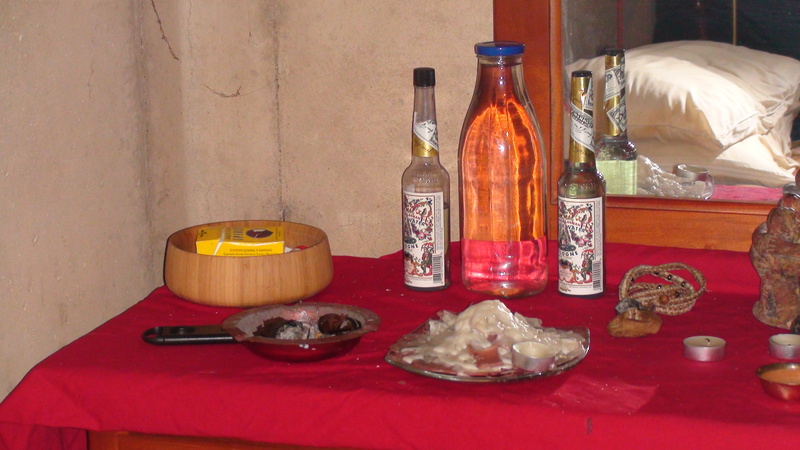 The blue vial to the left of the pewter chalice long contained the last of a Dansk Mjød Viking Blod that I eventually ended up offering that year. The crystal in front of the altar is selenite, a crystal I and my family still use to cleanse ourselves before some evening prayers. 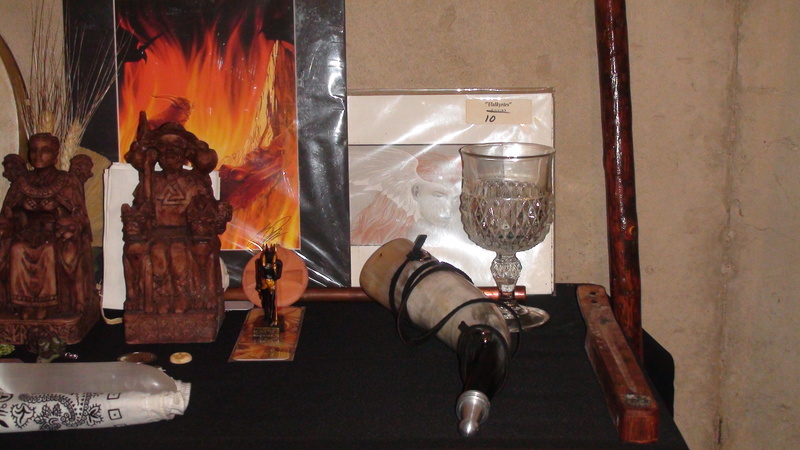 The Negative Confession is on this altar in front of the vial and pewter mug. The left side of the Gods’ Altar. The right side of the Gods’ Altar. A closeup of Anpu (center), Mani, and Sunna (left) on the Gods’ Altar. 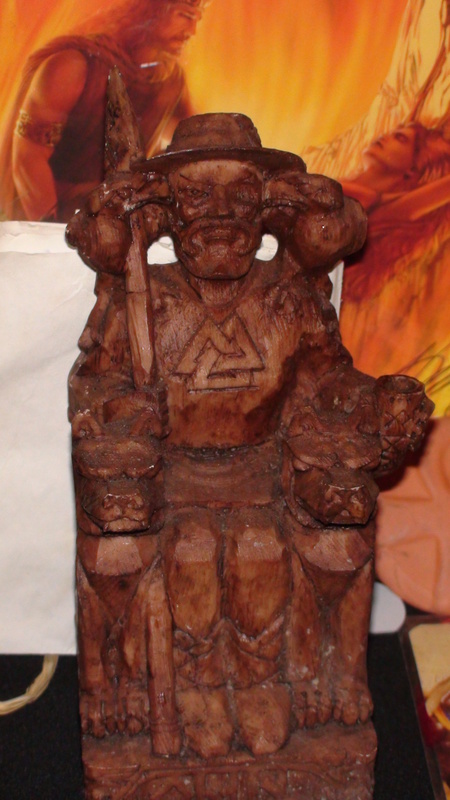 A closeup of Odin with Sigurd and Brynhilde behind Him on the Gods’ Altar. 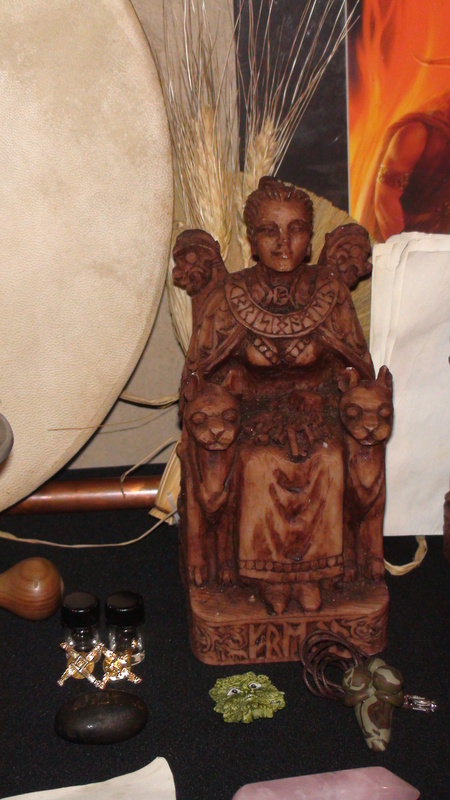 A closeup of Freya (center), Brighid and Bres (left), Freyr (front center), and Jord/Nerthus’ representation (right) on the Gods’ Altar. 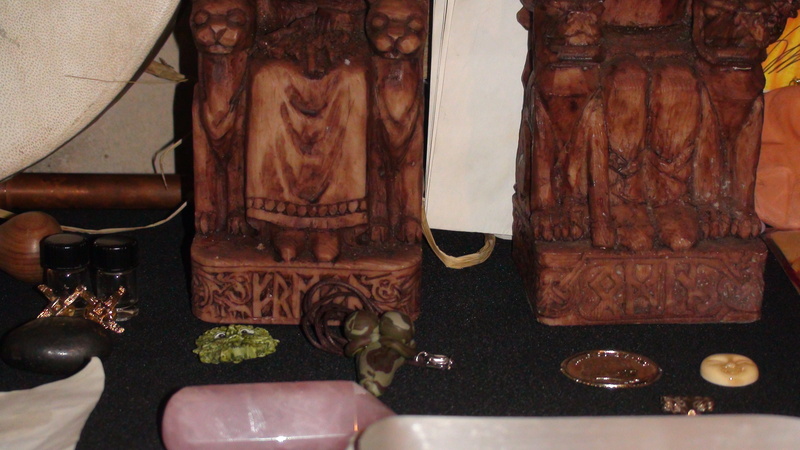 Left to right: Brighid and Bres, Freyr, Jord/Nerthus’s representation, Sunna, and Mani, closeup up before the statues of Odin and Freya. 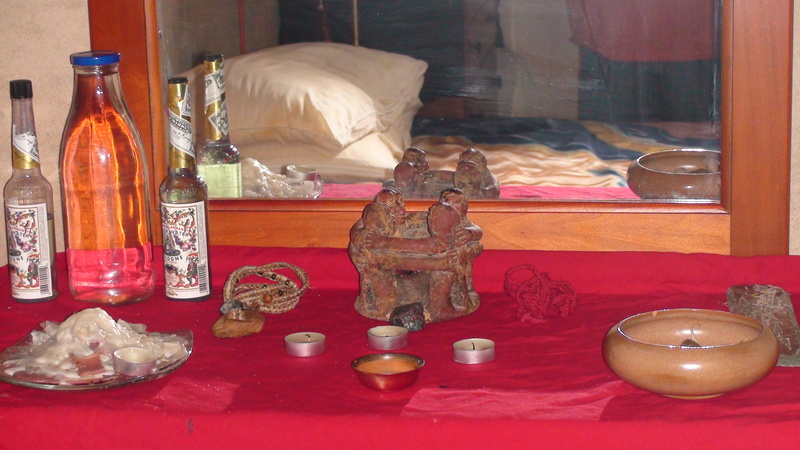 The Ancestor Altar/Shrine had finally come into being. 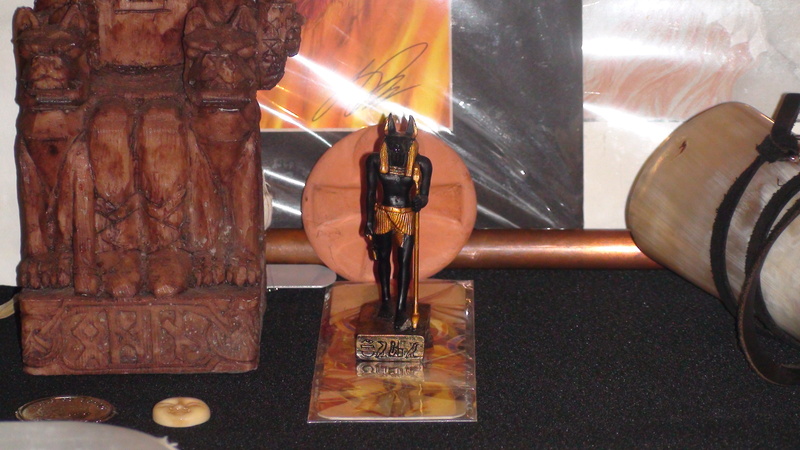 I had not been able to have a separate shrine for Them due to space issues, so being able to give space to the Elements as part of the Ancestors was wonderful as well as connective for me. With this came a sense of connecting not only with Them individually as Elements and Ancestors, but in the space of the altar/shrine itself, each Element having Their own space in the way it is laid out. This time also marked, roughly, when my Ancestors started asking for semi-regular tobacco offerings. I started doing smoking offerings in 2009, 2010. I had long held a taboo in my mind because of my parents’ smoking habits. The deal I made with Them was that, so long as I was not going to become addicted I would smoke for Them. So, cigars and cigarettes became part of the Fire area of the Ancestor shrine at this point, but that ended when Sylverleaf, our son, and I, transitioned as a family into the whole of the top floor of the house. A long shot of the center of the Ancestor Altar/Shrine. 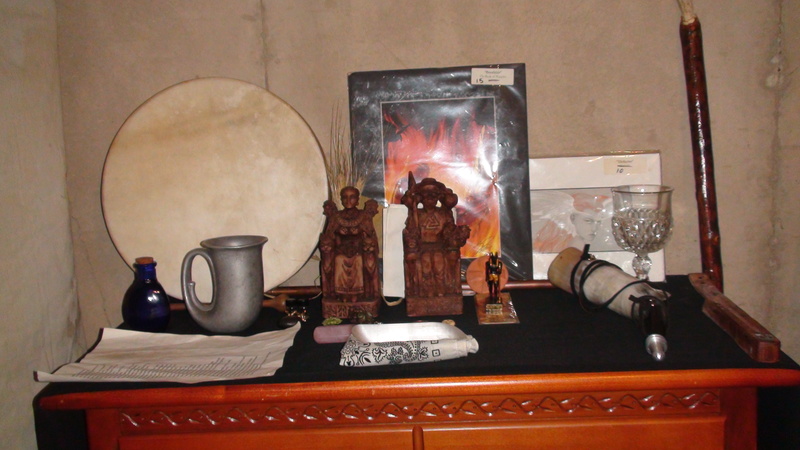 The center of the Ancestor Altar/Shrine. 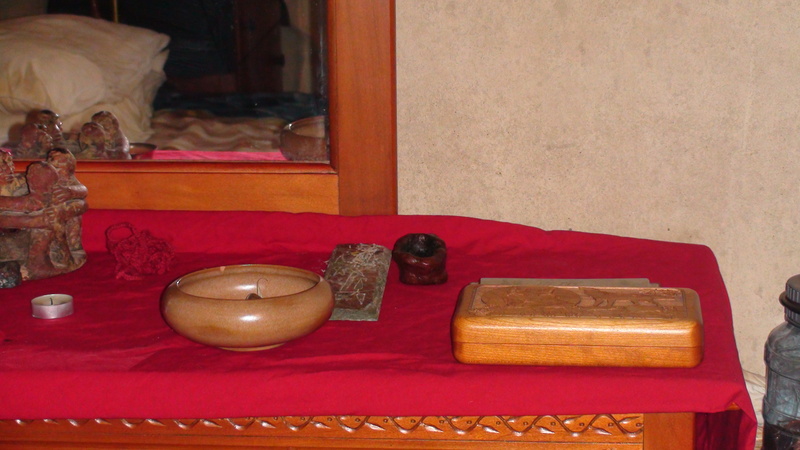 Left side of the Ancestor Altar/Shrine. Leftmost is the Fire area, and next to it, the Water area. 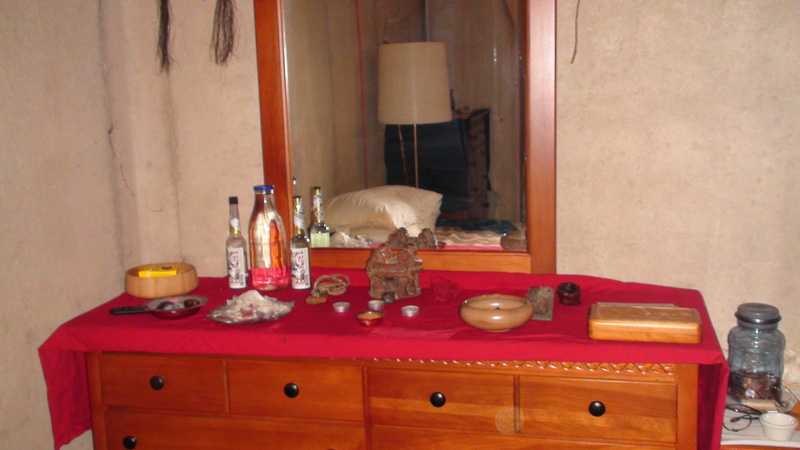 Right side of the Ancestor Altar/Shrine. 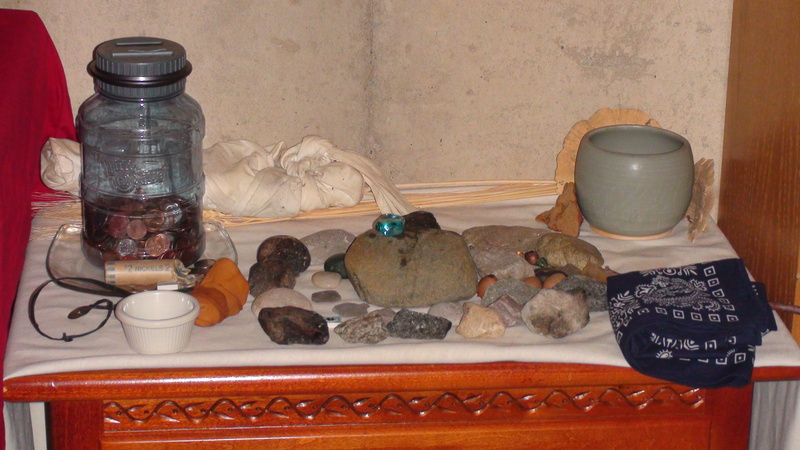 The Earth, represented by the bowl of stones, and Air, with the incense holder, are here. This was the second shrine I had set up for the Earthvaettir and Moneyvaettir; Their previous places had been set into a bookcase on a whole shelf. I do not believe the Warrior Dead had a shrine before this, and if it had, it had been rather squished in between everything with the Earthvaettir and Moneyvaettir. Here, again, I felt a sense of being able to breathe, of expanding not only my physical limits, but practice. Of having space to actually physically acknowledge Their place in my life, Their Presences, and to honor that not only with space, but with prayer in that space. Of giving offerings to those beings, whereas once They may have been lumped all in together with a single offering chalice between all of these great, diverse Gods, Ancestors, and vaettir otherwise, now I had space and ability to honor each closer to Their own ways and desires. The Earthvaettir, Moneyvaettir, and Warrior Dead shrines all on one surface. It was relieving to finally have space to do this. 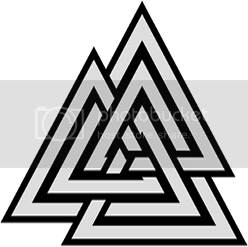 I honor a great deal of animalvaettir not only as representations of the Gods (i.e. the snake as Bolverk), but as the animals Themselves who have come and shared wisdom and training. Some of these representations pull double-duty; for instance, the wolf in the top above the center of the shrine is representative of both wolves, and Lupa, the Wolf Goddess who came to me early in my journey as a Pagan and in my self-discovery, helped me to realize a lot about myself. More, She helped teach me how to not only explore it, but integrate it into my life as best as I could. As the Wolf has been a central figure in my life as a whole, and as I mark It as kin, it forms the center of this shrine. The patch of fur and wolf bones were gifts by the wonderful Shin Cynikos. I keep these as sacred items to this day. They still lay upon the animal spirits’ shrine. 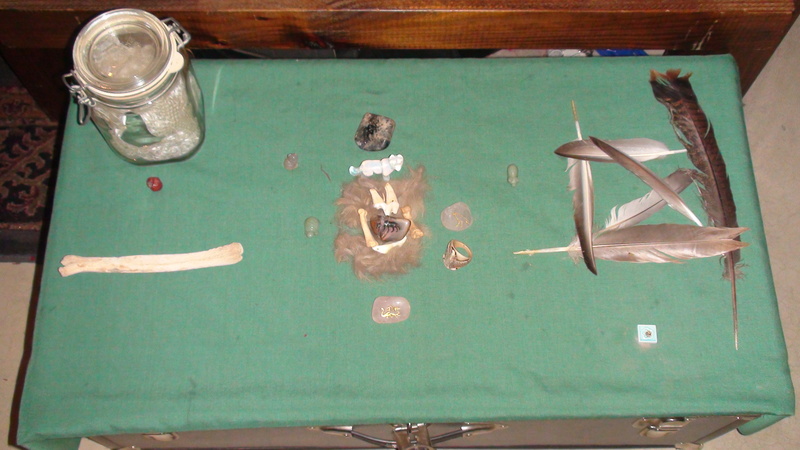 The Animal Spirits Altar in 2012. It lay on an old steamer trunk a friend gave to me. It wasn’t long before I transitioned out of this kind of layout. When I moved back into my old room upstairs to live with my family, there was a lot more room to expand, and express the changing relationships and growth in our lives together. The next post will go into the expansion that occurred at that time, and what the altars and shrines tend to look like nowadays. It’s really interesting to see how altars change. My entire apartment (having been given to Loki early on) had to change recently, due to a development in our relationship, and so now everything has really changed and moved. It’s interesting and almost fun, although it was disconcerting at first. It is pretty disconcerting sometimes when you get used to things being a certain way and then time, circumstance, or need changes everything up. It’s a powerful reminder, though, that we are in living relationships with our Gods, and so it makes sense that the outward reflections of our relationships with Them would show that too. Nice pictures of some beautiful altars/shrines.